I had to skip a couple of weeks updating my comics journalism archive for several reasons. I'm glad to get back into the routine with one of the more interesting reviews I did for the site I don't directly name here. I equally enjoyed and was baffled by this series, and I sadly stopped following the series. I really want to catch up with it someday. Originally published April 4, 2012. Edited for clarity. The original Bulletproof Coffin mini series by David Hine and Shaky Kane was such an anomaly in the comics world when it came out, and it remains so. A straight action and drama in an Orwellian future/present, Hine's prose holds it together like a dark parody of the superhero genre with Kane's art exaggerating, mocking and complimenting it at the same time. I keep going back to it being as close to a Terry Gilliam film on ink and paper without Gilliam actually drawing it, it's ending almost Brazil-like in its happy dystopian setting. If that isn't enough to have you buy the collection, you should pick up this new series of what appears to be stand alone stories or barely connecting tales of a comic book universe within another fictional universe that we still only have vague hints of. 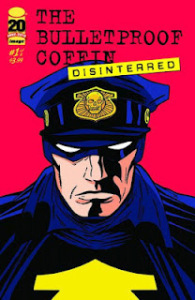 The first issue of The Bulletproof Coffin: Disinterred features a murder mystery that seems to focus on one of the other comic book characters from the first series. In the end, is it an origin story (like that of the first series' main hero The Coffin Fly) someone acting on his own twisted fantasies, or both? I'm not expecting to find answers, nor am I looking for them. Given that two of the slated stories include "Tales From The Haunted Jazz Club" and, in the words of the editorial, "the tale of an overweight housebreaker in search of her lost child," I think the majority of the stories are likely to be barely related or unrelated at all. Something I actually prefer. Hine and Kane can publish stories like this under whatever pretenses they want (in this case, posing as over the hill comic book creators for a fictional company). They've created a palpable world I don't necessarily want to see resolved and wrapped up any time soon.